In this section of the ADMIN module, you can add or remove the roles that you can assign to project members and you can manage the access rights that each role grants. 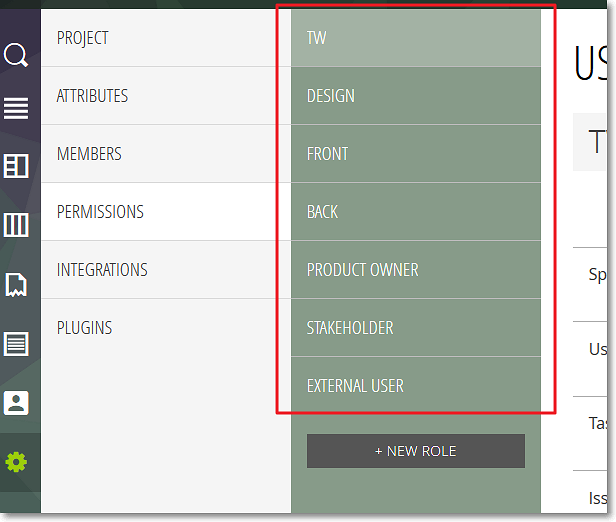 When you access this section, you can view a list that shows the existing roles for the current project. To manage the access rights that each role grants, click the name of a role – this action displays the manage rights form on the right side of the list that shows the existing roles. Note: The EXTERNAL USER role cannot be deleted, but you can manage its access rights. This role is used to allow users that are not members of the current project to access specific parts of the project. For example, they can access a User Story details page via a link to that page, if the right to access User Stories has been granted for External Users. For more details about managing access rights, you can go to Managing access rights. Note: On the right side of the name of a project element, you can view the number of actions enabled for that element and the total number of actions that can be managed for that element (actions enabled/total number of actions). As a visual representation, green rectangles show actions enabled and grey rectangles show actions disabled – the total number of rectangles also shows the total number of actions that can be managed (enabled or disabled).